This story was originally published in the April 13 print issue. The circus is back in town. The Ringling Brothers and Barnum & Bailey Circus returned to the Patriot Center Wednesday Apr. 8 for its annual visit to Mason, an event that draws large crowds from the surrounding Fairfax area as well as the attention of animal rights activists. Ringling Bros. and Barnum & Bailey presents LEGENDS has 16 scheduled show times over the course of two weeks, starting Wednesday at 7 p.m. and ending with a 5 p.m. show on Sunday, Apr. 19. Featuring a different theme each year, this year’s LEGENDS edition gives audiences the opportunity to “experience magnificent Asian elephants, a 20-acrobat troupe perched atop only a pair of bicycles and a never-before-seen, double-wide, high-flying trapeze act,” according to the event description on the Patriot Center website. Not everyone at Mason has embraced the circus, however. 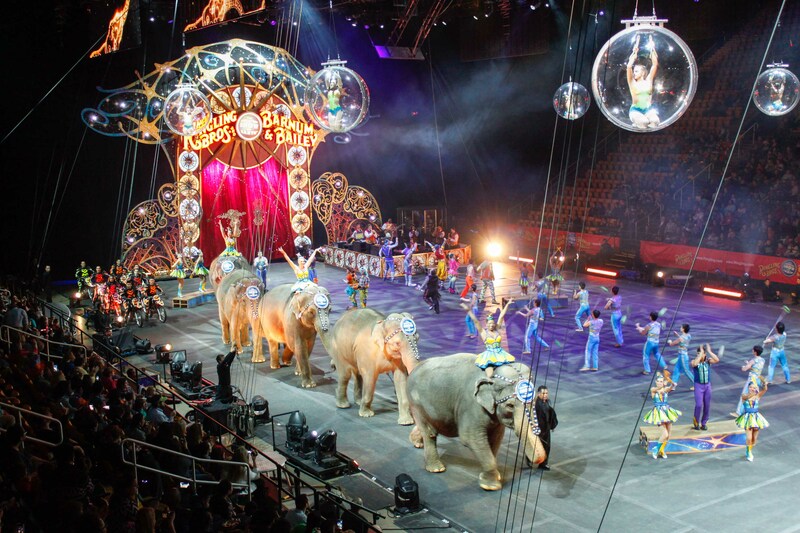 Since the Ringling Bros. first came to Mason in 2001 as part of their yearly tour circuit, their performances have been accompanied by protestors from both student groups like Animal Rights Collective and national organizations like People for the Ethical Treatment of Animals. Ariel Koris and Kelly Harty, both seniors at Mason, organized a group of students to protest the circus for its treatment of the animals it uses in its performances. Koris and Harty said they started organizing the protest after watching the documentary An Apology to Elephants, a 2013 film depicting the physically and psychologically abusive conditions in which many captive circus and zoo elephants live. After reaching out to friends by creating a Facebook event page, which now has more than 100 people listed as ‘going’, they spoke to other students in their classes to gauge on-campus interest in a protest. “Nobody would want the circus here once they found out what abuse was happening to the animals,” Harty said. Their main protest took place Apr. 8, but they plan on having other ones, possibly once a week or on Thursdays when a lot of people tend to be on campus. Koris and Harty are not the first to protest the circus’s presence at Mason. ARC, a student organization “dedicated to raising awareness animal rights on [Mason’s] campus and within the surrounding community”, was founded in 2009 by students looking to protest the Ringling Bros. circus, according to ARC’s Facebook page. Though the group no longer appears to be active and is not listed in university life’s CollegiateLink database, it led protests against the circus from 2009 through 2014. ARC’s protests received official recognition in 2011 when the Mason student senate passed a resolution backing their efforts. The senate cited documented cases of unsanitary feeding conditions, lack of proper veterinary care and general mistreatment of the animals as reasons why it supported the protests. Ringling Bros. has long been criticized for its use and treatment of animal performers, particularly its elephants. Photographic and video evidence as well as the testimony of former Ringling employees collected by organizations like PETA suggest that its animals are often chained up and confined to concrete-floor cages or box cars and trained using whips and bull-hooks, pointed metal sticks that resemble fire pokers. These conditions lead to health complications, like foot diseases and chronic pain, and have resulted in the deaths of more than 30 elephants since 1992, according to the website Ringling Beats Animals. Feld Entertainment, the parent company of Ringling Bros. and Barnum & Bailey and other traveling programs like Disney on Ice, paid a $270,000 fine to the U.S. Department of Agriculture in 2011 for alleged violations of the Animal Welfare Act. According to the USDA, the settlement was the largest ever assessed against an exhibitor in U.S. history. 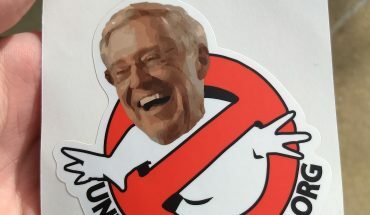 Mathews worked on a Ringling protest last year at Mason that was led by students but backed by PETA, which provided materials like posters, leaflets and coloring books. 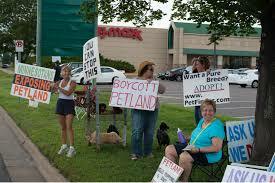 PETA is picketing outside the Patriot Center again this year with 15 protests planned. Despite the opposition, Geisler says that Mason has never reconsidered hosting the Ringling Bros. circus since it started in 2001. According to Mathews, the turnout for PETA’s protests last year at Mason ranged from 15 to 40 people. He argues that the constant presence of protestors – whether an individual show attracts five people as it does in many smaller cities or the thousands that protest in large cities like Los Angeles or New York City – has been enough to put pressure on Ringling Bros to change. Ringling Bros. announced Mar. 5 that its 13 remaining elephants will retire by 2018. Though Feld Entertainment CEO Kenneth Feld said the decision was the result of internal family discussions rather than due to pressure from animal rights groups, he also said in a Chicago Tribune article that legislation recently passed in many cities and counties banning wild animal performances or the use of bull-hooks for training elephants has made it more difficult for the circus to schedule tours. Koris and Harty said that they found the news that the elephant act will be retired welcome but wish Ringling would end it now instead of in three years and stop using other animals like lions, tigers and camels. Some activists also argue that the Center for Elephant Conservation, the central Florida facility owned by Ringling Bros. where the remaining elephants will join 29 already-retired elephants, is inadequate as an alternative to their current environment. Senior Michelle Bennett says that her animal rights and ecofeminism class, which she took as part of her social justice minor, watched video footage of the Center for Elephant Conservation that showed trainers still using bull-hooks. The video also showed elephants being kept in individual pens rather than having space to roam freely. “It looks really great on the surface, but when you really examine it, it’s not so good,” Bennett said. Taught through Mason’s New Century College by Paul Gorski, Bennett’s class is also planning to protest the circus as part of a class assignment. The original assignment was not specifically focused on the circus and simply instructed students to work in groups to design campaigns addressing animal rights issues, according to Gorski. However, the students decided to collaborate as one large group to address the circus’s visit. Students in the class have planned to protest at four different performances. While attendance at the physical protest, which will include face-painting as well as posters and signs, is optional, they are also developing a petition for students to sign and flyers that will be distributed as part of an educational campaign. “We just want to educate the public and give them the opportunity to see the realities of what goes on for the animals that are being used as entertainment,” Bennett said. Animal rights concerns are not the only reason why some students dislike the annual circus visit to Mason. Like other major events on campus, the circus frequently prompts complaints about traffic and parking availability. According to parking director Josh Cantor, the circus is Mason’s most heavily-attended event. Because it has several shows over the course of two weeks, the circus can be more disruptive for people commuting to campus for classes than, for example, a performance at the Concert Hall, which generally has events on Friday and the weekend. In addition, portions of some parking lots are always blocked off to provide space for the circus to set up. Mason’s parking and transportation services sends out a campus-wide email every year to alert students, faculty and staff of the circus’s arrival. Sent Apr. 2, the email said that circus tents and fencing will take up space in lots A and L starting Saturday, Apr. 4. Lot K will also be used for staging on Monday, Apr. 6. Drivers arriving to campus after 10:00 a.m. are advised to “head directly to the back of lot K, Mason Global Center, the PV lot and the Field House parking lots (M, O and P).” In addition, lot H will be available to all general permit holders between 5 p.m. and 7 a.m. on weekdays and all day on weekends. The circus will completely vacate all parking lots by Tuesday, Apr. 21. Cantor says that, because parking services’ communication methods have improved, he sees fewer parking complaints than he did when he first arrived 10 years ago. Despite the animal rights controversy and parking complaints, Ringling still appeals to many people in part because it has been around for nearly a century. She suggested Cirque de Soleil, which uses only human performers, as a possible alternative attraction that the Patriot Center could host. Junior Page Fedors, who acquired tickets for one of this year’s performances with a friend, says she has a lot of nostalgia from visiting the circus with her family when she was young. Senior Hossein Karkehabadi went to the circus once in California, though he says that he does not plan on seeing it at Mason. Currently a senior at Mason, I am majoring in English with a concentration in creative writing and minoring in communications. I have been writing for GMU's undergraduate student newspaper Fourth Estate since the fall 2013 semester.